Assume inflation is stable, there is excess productive capacity, and the central bank maintains its current monetary policy setting. It is then true that if government spending increases by $X dollars and private investment and exports are unchanged then nominal income will continue growing until the sum of taxation revenue, import spending and household saving rises by $X dollars. So at the start of Period 1, the government increases spending by $100. 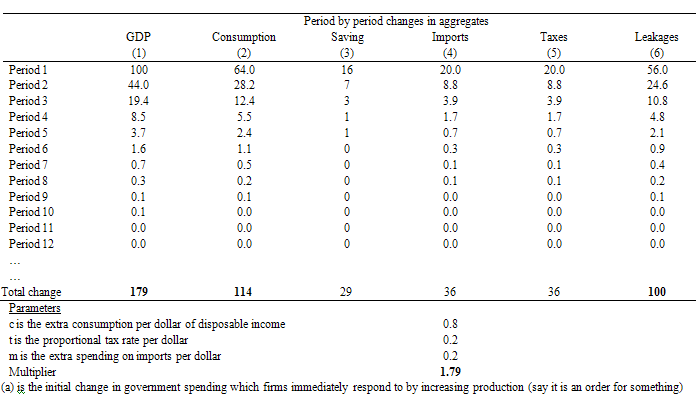 The Table then traces out the changes that occur in the macroeconomic aggregates that follow this increase in spending (and “injection” of $100). The total change in real GDP (Column 1) will then tell us the multiplier value (although there is a simple formula that can compute it). The parameters which drive the individual flows are shown at the bottom of the table. While a sovereign government is not revenue constrained and voluntarily constrains itself to borrow to cover its net spending position, it remains the case that by substituting its spending for the borrowed funds it reduces the private capacity to borrow and spend. a href=”http://bilbo.economicoutlook.net/blog/?p=6624″>Building bank reserves is not inflationary – for further discussion. (a) excessive national government spending led to inflation. (b) the national government had to issue debt to cover spending above taxation. (c) the national government could not use net spending to achieve full employment. The correct (best) answer is – Option (b) that under the former system, the national government had to issue debt to cover spending above taxation. Under the gold standard the paper money issued by a central bank was backed by gold. A currency’s value was expressed in terms of a specified unit of gold and there was convertibility which allowed a person to swap the paper money for the relevant amount of gold. A parity was fixed and central banks agreed to maintain the “mint price” of gold fixed by standing ready to buy or sell gold to meet any supply or demand imbalance. Further, the central bank (or equivalent in those days) had to maintain stores of gold sufficient to back the circulating currency (at the agreed convertibility rate). Gold was also considered to be the principle method of making international payments. Accordingly, as trade unfolded, imbalances in trade (imports and exports) arose and this necessitated that gold be transferred between nations to fund these imbalances. Trade deficit countries had to ship gold to trade surplus countries. This inflow of gold would allow the governments in surplus nations to expand the money supply (issue more notes) because they now had more gold to back the currency. This expansion was in strict proportion to the set value of the local currency in terms of grains of gold. The rising money supply would push against the inflation barrier (given no increase in the real capacity of the economy) which would ultimately render exports less attractive to foreigners and the external deficit would decline. From the perspective of an external deficit nation, the loss of gold reserves forced their government to withdraw paper currency which was deflationary – rising unemployment and falling output and prices. The latter improved the competitiveness of their economy which also helped resolve the trade imbalance. But it remains that the deficit nations were forced to bear rising unemployment and vice versa as the trade imbalances resolved. Monetary policy became captive to the amount of gold that a country possessed (principally derived from trade). Variations in the gold production levels also influenced the price levels of countries. After World War 2, the IMF was created to supercede the gold standard and the so-called gold exchange standard emerged. Convertibility to gold was abandoned and replaced by convertibility into the US dollar, reflecting the dominance of the US in world trade (and the fact that they won the war!). This new system was built on the agreement that the US government would convert a USD into gold at $USD35 per ounce of gold. This provided the nominal anchor for the exchange rate system. The Bretton Woods System was introduced in 1946 and created the fixed exchange rates system. Governments could now sell gold to the United States treasury at the price of $USD35 per ounce. So now a country would build up US dollar reserves and if they were running a trade deficit they could swap their own currency for US dollars (drawing from their reserves) and then for their own currency and stimulate the economy (to increase imports and reduce the trade deficit). The fixed exchange rate system however rendered fiscal policy relatively restricted because monetary policy had to target the exchange parity. If the exchange rate was under attack (perhaps because of a balance of payments deficit) which would manifest as an excess supply of the currency in the foreign exchange markets, then the central bank had to intervene and buy up the local currency with its reserves of foreign currency (principally $USDs). This meant that the domestic economy would contract (as the money supply fell) and unemployment would rise. Further, the stock of $US dollar reserves held by any particular bank was finite and so countries with weak trading positions were always subject to a recessionary bias in order to defend the agreed exchange parities. The system was politically difficult to maintain because of the social instability arising from unemployment. So if fiscal policy was used too aggressively to reduce unemployment, it would invoke a monetary contraction to defend the exchange rate as imports rose in response to the rising national income levels engendered by the fiscal expansion. Ultimately, the primacy of monetary policy ruled because countries were bound by the Bretton Woods agreement to maintain the exchange rate parities. They could revalue or devalue (once off realignments) but this was frowned upon and not common. Whichever system we want to talk off – pure gold standard or USD-convertible system backed by gold – the constraints on government were obvious. The gold standard as applied domestically meant that existing gold reserves controlled the domestic money supply. Given gold was in finite supply (and no new discoveries had been made for years), it was considered to provide a stable monetary system. But when the supply of gold changed (a new field discovered) then this would create inflation. So gold reserves restricted the expansion of bank reserves and the supply of high powered money (government currency). The central bank thus could not expand their liabilities beyond their gold reserves. In operational terms this means that once the threshold was reached, then the monetary authority could not buy any government debt or provide loans to its member banks. As a consequence, bank reserves were limited and if the public wanted to hold more currency then the reserves would contract. This state defined the money supply threshold. The concept of (and the term) monetisation comes from this period. When the government acquired new gold (say by purchasing some from a gold mining firm) they could create new money. The process was that the government would order some gold and sign a cheque for the delivery. This cheque is deposited by the miner in their bank. The bank then would exchange this cheque with the central bank in return for added reserves. The central bank then accounts for this by reducing the government account at the bank. So the government’s loss is the commercial banks reserve gain. The other implication of this system is that the national government can only increase the money supply by acquiring more gold. Any other expenditure that the government makes would have to be “financed” by taxation or by debt issuance. The government cannot just credit a commercial bank account under this system to expand its net spending independent of its source of finance. As a consequence, whenever the government spent it would require offsetting revenue in the form of taxes or borrowed funds. The move to fiat currencies fundamentally altered the way the monetary system operated even though the currency was still, say, the $AUD. This system had two defining characteristics: (a) non-convertibility; and (b) flexible exchange rates. First, under a fiat monetary system, “state money” has no intrinsic value. It is non-convertible. So for this otherwise “worthless” currency to be acceptable in exchange (buying and selling things) some motivation has to be introduced. That motivation emerges because the sovereign government has the capacity to require its use to relinquish private tax obligations to the state. Under the gold standard and its derivatives money was always welcome as a means of exchange because it was convertible to gold which had a known and fixed value by agreement. This is a fundamental change. Second, given the relationship between the commodity backing (gold) and the ability to spend is abandoned and that the Government is the monopoly issuer of the fiat currency in use (defined by the tax obligation) then the spending by this government is revenue independent. It can spend however much it likes subject to there being real goods and services available for sale. This is a dramatic change. Irrespective of whether the government has been spending more than revenue (taxation and bond sales) or less, on any particular day the government has the same capacity to spend as it did yesterday. There is no such concept of the government being “out of money” or not being able to afford to fund a program. How much the national government spends is entirely of its own choosing. There are no financial restrictions on this capacity. This is not to say there are no restrictions on government spending. There clearly are – the quantity of real goods and services available for sale including all the unemployed labour. Further, it is important to understand that while the national government issuing a fiat currency is not financially constrained its spending decisions (and taxation and borrowing decisions) impact on interest rates, economic growth, private investment, and price level movements. We should never fall prey to the argument that the government has to get revenue from taxation or borrowing to “finance” its spending under a fiat currency system. It had to do this under a gold standard (or derivative system) but not under a fiat currency system. Most commentators fail to understand this difference and still apply the economics they learned at university which is fundamentally based on the gold standard/fixed exchange rate system. Third, in a fiat currency system the government does not need to finance spending in which case the issuing of debt by the monetary authority or the treasury has to serve other purposes. Accordingly, it serves a interest-maintenance function by providing investors with an interest-bearing asset that drains the excess reserves in the banking system that result from deficit spending. If these reserves were not drained (that is, if the government did not borrow) then the spending would still occur but the overnight interest rate would plunge (due to competition by banks to rid themselves of the non-profitable reserves) and this may not be consistent with the stated intention of the central bank to maintain a particular target interest rate. Importantly, the source of funds that investors use to buy the bonds is derived from the net government spending anyway (that is, spending above taxation). The private sector cannot buy bonds in the fiat currency unless the government has spent the same previously. This is a fundamental departure from the gold standard mechanisms where borrowing was necessary to fund government spending given the fixed money supply (fixed by gold stocks). Taxation and borrowing were intrinsically tied to the government’s management of its gold reserves. So in a fiat currency system, government borrowing doesn’t fund its spending. It merely stops interbank competition which allows the central bank to defend its target interest rate. The flexible exchange rate system means that monetary policy is freed from defending some fixed parity and thus fiscal policy can solely target the spending gap to maintain high levels of employment. The foreign adjustment is then accomplished by the daily variations in the exchange rate. If the savings rise was by business rather than household, would that not allow an interpretation that the answer to Q1 is false? cs @18:27, Yes, I agree that was a really good discussion of the gold standard. But I also have some confusion about the sentences you quoted. My guess is that Bill put some words in the wrong order there and that it could use some editing. Recently John Adams and Martin North discussed the RBA wanting to take Australia out of cash and are looking at a dual currency which would include an eAUD. I have attached a link to the video. I searched your blog for a mention of it but could not find any reference. John Adams is suggesting some sort of elitist push to drive down interest rates to negative .5% approx. I found his comment about the Japanese buying up safes and hoarding cash a result somewhat amusing. 1] Being able to take interest rates down to -1%, does not let you take interest rates down to -3% or -4% if they are at 3% when the crisis starts. So, what is the benefit of this? 2] Do negative rates mean that someone gets -X%/year on all your money in the bank? Who gets it? If it is the central bank/Gov. then it is just a tax on all wealth in the form of money. This will impact the poor more than the rich because it is a flat tax. 3] I would guess that even the negative interest rates reason is not the real reason. That the real reason is to be able to freeze the money assets of people the Gov. doesn’t like. Giving the Gov. total control over every person.
. . . Think about it. How long can you live if you are thrown back on to the assets you can carry with you [gold rings, and old cash]? How far can you run if you can’t buy gas for the car? It seems like the Gov. would own you if it chose to. And do we trust the Gov. that much? I do NOT! Steve, I WOULD trust the government IF it were the one described in the Preamble to America’s DOI; namely, an instrument, called into existence by the people, to ensure their equality by securing their inherent rights to life, liberty, and the pursuit of happiness. That description of democratic or republican government, among the most succinct and sublime expressions of Enlightenment values, must be resurrected and brought to its full power through the axioms of MMT, if progressives are to reclaim the state as Bill and Tom have proposed. But so long as the government remains the slave of elites, your distrust is more than warranted. Hmm..still not clear 'to increase imports and REDUCE the trade deficit' -but surely that would have to happen with exports outpacing the increase in imports?? My head hurts like when I try to play chess (badly) and trie to think more than three moves ahead! I’m sure you’ve seen this from Bloomberg, but I felt this represented an altogether fairer and more professional effort on the part of these journalists. It’s not a hagiography but it has a completely different tone from other recent offerings – which seems to have been very much aided by the launch of the textbook (looking forward to the imminent arrival of my copy, of course…). very exciting ! Got my macroeconomics text book! Thanks Bill. Question 1: I must be missing something or misinterpreting a definition. If the government increases its spending by X, then by the sectoral balance law the the sum of tax, import spending and net financial assets (NFA) of the domestic private sector must increase by X. I assume that the increase in NFA of households is the increase in their savings. If the proposition of this question is correct, then the increase in NFA of the non-household part of the private sector must tend to zero and I don’t see any reason why this must hold. Thanks very much. We appreciate your purchase. You will be getting 3/3 each week now. The answer to question 1 is true only if you base your predictions of economic behaviour on naive or simplictic ex post accounting identities. If you consider the complexity of real economic activity the answer is neither true nor false. For instance, G may be increased in an economic downturn to prevent the liquidation of highly unproductive investments, thereby helping or cementing the erosion of the long-term growth potential of the economy. Hence, an increase in government spending can increase and decrease Y – completely regardless of the other variables. The answer to question 1 is true irrespective of the situation that arises. While it is true that in a dynamic world it is impossible to isolate the leakages and injections, they are continually evolving, it is conceptually true that for income to stabilise after a shock the leakages have to match the injection that drove the change in income/output. I`m envious. :-) … Ordered mine on Jan.21st 2018 from Amazon and have not yet got a shipping notification. The site now shows “Temporarily out of stock”, however! I am actually happy to see that. I can, as they say, “hang tough” for a while. I am going to toss my opinion in the ring here. That ex-post identity to which you refer, simplistic, naïve or otherwise, is simply a description of the “resultant behavior” of the relationships amongst those variables which define that “ex-post” identity. It is in no form or fashion a “predictor” of economic behavior. From that point of view, question one has to be true in any and all circumstances. Sorry, I posted before completion. After economic behavior…………………. The “resultant behavior” is explained through the expenditure multiplier. Looks like I might have lost a message or had it removed. anyway, please forgive my behaviour with the spelling of behaviour.